Jimmy Buffett, eat your heart out. Dig my pencil-thin mustache.Who would have known how much fun a kid/woman could have with index cards, a marker, scissors, and a nose? I have been laughing my belly button off making these goofy mustaches. 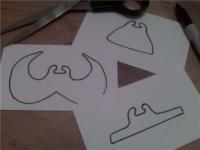 Creating cardstock mustaches is super easy to do. On your index card, simply trace your desired mustache shape. The only tricky part is making the tiny nostril hooks fit just right. Make them too small and they'll pinch a little. Make them too wide and your stash won't stay. What's up, Doc? Look at this funny mustache! Check out the Bugs Bunny teeth. Isn't that a crack-up? I would LOVE to see what you come up with. I'll bet your mustaches will be mega-tons better than mine. Send me some pics of you and your stash. They're sure to be hilarious! Email me, if you'd like, at debbadee5@gmail.com. Long live Simple Saturday silliness. Need to assume an alternate identity? Blend into the scenery? Keep a low profile? Slip away in the shadows? Well, what you need, my sleuth-like friend, is a fuzzy-faced disguise and tomorrow I'll show you how to make one. For your simple supply list all we need are index cards, markers, scissors, and your charming little nose. Fake fur or fuzz of any kind is optional. With Tripod the Fur Shedding Machine it will be easy for me to gather up plenty of fuzz around here. Need some?